On April 9, more than fifty years ago, I was on my way home from Vietnam. A Chinook picked me off the ground at the DMZ, under fire. My guys shot back to keep the helicopter in the air. Ten of us got on that Chinook. The pilot couldn’t land so he hovered. He told me to number the ten getting on, five for home, five for R&R. I was number 10. His gunner grabbed us and threw us into the copter and we were told to “stay on the floor.” As we rose bullets came through where the windows were, no glass in them, ricocheting around inside over our heads until we rose high enough. I was at the door and watched the ground disappear and prayed we’d keep going up. Then from Da Nang to Okinawa in a KC 130, we sat in the seats along the sides with flag-covered coffins in the middle. My plan was to pick up my extra sea bag I’d stored in Okinawa before heading to Vietnam. When deployed, we’d carried two sea bags with identical stuff: One bag was taken into Vietnam and the other sea bag was stored in Okinawa for our trip home. My plan was to pick up my extra sea bag and change into better clothes for the rest of the trip home. However, my sea bag in Okinawa was missing. As I found out later they seemed to lose a lot of sea bags. Sarcasm never gets anywhere good. We landed in the middle of the night. I went with the MPs who took me to a bathroom in the airport and secured the door and said, “Clean yourself up.” The Colonel had called ahead from the plane and gotten bathing materials, and a uniform, from underwear to ribbons made up for me to wear. They held the plane for me. When I got back on the plane and walked by him all he did was smile. And off to Travis Air Force base near San Francisco we went. Once there, we were given civilian clothes and told to change before leaving for the San Francisco International Airport (SFO). They warned us people would be waiting who weren’t going to welcome us home. When we arrived at SFO, sure enough, the anti-war protesters were there. All of us tried to hide from who we were. We had to hide that we had been in Vietnam. No welcome home there. Then we were off to our cities, mine Seattle. After landing in Seattle there were more anti-war folks, spitting on us and calling us names. Still no welcome home. On April 10, 2018, I was going to do something special to recognize those 50 years, but decided to just stay home doing what I’m supposed to do—draw portraits. Gold Star families await their fallen heroes to come home. I can help with that. Semper fi! Oh, that’s my coming home story and I’m sticking to it. I want to say thank you to everyone who reads my coming home story. I’ve wanted to tell it for a long time. I want to personally to thank you for making it different for all our veterans now. That’s the best thing that could have happened for all of us from that other time. I am proud to be a Marine Vietnam Vet. For me personally, remember Vincent Santaniello and Peder Armstrong. Two Marine friends of mine who never made it home from Vietnam. I was with them when they died and Vinny’s last words were, “Mike I just want to go home.” Remember them. 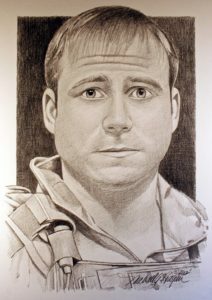 Michael Reagan honors the American Fallen Heroes for their ultimate sacrifice during the war against terrorism by creating free, hand-drawn portraits of Fallen Heroes for Gold Star Families. 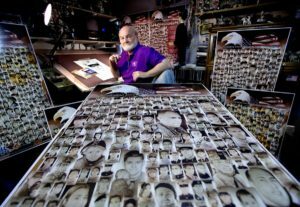 To date he has done more than 5300 of them. On March 25, 2015, the Medal of Honor Society at Arlington honored Michael Reagon with the Citizen Service Before Self Honors, which is also referred to as the Civilian Medal of Honor. After drawing Oprah Winfrey to finish off 1997, a portrait she gave to her father for Christmas, Michael followed that in 1998 by doing portraits for Harrison Ford, Senator John Glenn, Gregory Peck and Joan Fontaine. He also completed his first charity lithograph for the Richard Karn/Fred Hutchinson Cancer Research “Star days”. This litho was sold as a fund raiser art piece and included images of 30 separate celebrities. Michael is also member of the steering committee of this foundation. In addition to these projects, Michael was appointed Director of Trademarks and Licensing for the University of Washington. He was also chosen to be the artist that designed the new Husky dog logo seen on many of the Husky products. Returning from Vietnam in one piece meant adjusting to civilian life. After driving a truck and selling furniture for a living, Mike entered the Burnley School of Professional Art (now the Art Institute). He landed a job with the Seattle School District in 1974, where he worked as a computer programmer. Mike’s interest in art intensified, reaching a peak when he met actor Van Johnson backstage during a stage performance in Seattle. The pair hit it off. Because of Mr. Johnson’s gracious treatment of Mike’s guests, Mike drew a pencil sketch of the star and personally presented it to him as a symbol of gratitude. Today, over fifteen hundred celebrity portraits are in Mike’s collection. A small sampling includes: Bob Hope, Red Skelton, George Burns and Ingrid Bergman, Pope Paul, former Presidents Reagan, Carter, Ford, Nixon, and Bush, and their first ladies. Mike has drawn all the Heisman Trophy winners; most of the NFL Hall of Fame inductees; along with Mickey Mantle, Joe DiMaggio, Nolan Ryan and Mark Maguire. Mike’s reputation and works are recognized internationally. Over the last 25 years Mike’s portraits for charity alone have raised $10,000,000 nationally. Mike once said to a reporter, “I’ve been given a gift. I hope I’m doing what I’m supposed to with it.” There are a lot of people, especially Gold Star families, who believe he is and are thankful for his gift that honors their loved ones.